A recent report from eMarketer looks at a variety of digital factors impacting today’s online customer experience. The conclusion that consumers are having (and thus expecting) highly personalized experiences is no surprise, but these trends (some working in conflicting directions) may leave you feeling like you’re between a rock and a hard place when it comes to personalization. Yes, marketers are still shook up over GDPR, especially since many of the news and media outlets where they advertise have stopped using third-party cookies for targeting. But that doesn’t mean you can’t get creative with top-funnel content and contextual targeting without fear of a GDPR fine. Our own Chad Pollitt even posits that GDPR’s ultimate silver lining is higher quality content for consumers and higher quality audience-building for brands. At what point does personalization become too personal? For folks of a certain vintage, showing them a social media ad for your product after they just visited your website crosses that line. For others, they’re delighted to have their digital wallet connected to your website, allowing for an instant, one-click purchase. So, where’s the happy medium? It all starts with, and depends on, your audience and how much information they’re comfortable sharing with your brand. One thing we do know: users are hesitant to share information with an unclear connection to marketing e.g. family makeup or professional information, and find it especially creepy when that information is gleaned from social networks (Avionos, “Enabling Experience-Driven Commerce Anytime, Anywhere” pp.11-12 ). Deciding not to amplify your content because it might end up in an environment deemed unsafe for your brand is like being one of those people who never leaves their house for fear of the chance that they might be killed in an accident. Yes, it’s possible that it could happen, but should you let that possibility control your behavior like that? In his AdExchanger article “Brand Safety Cannot Be The Duty Of Everyone But The Responsibility Of No One” Phil Schraeder, president and chief operating officer at GumGum, says that brand safety standards are not a one-size-fits-all approach. He believes both brands and agencies need brand safety officers so they can “monitor content of the ad ecosystem, as these are the organizations that are likely to care the most about how their brands are perceived by their consumers.” Publishers and platforms, he says, don’t have the same skin in the game. While there’s lots being done to address brand safety concerns, there’s still not much of a solution beyond careful oversight. Even if you don’t have the authority to create and hire a new position as Schraeder suggests doing, make sure it’s clear whose responsibility it is (at the brand and agency) and ask them to report on brand safety regularly. This chart from the eMarketer report on personalization indicates that 72% of consumers want to see social posts about discounts and deals, yet just 18% of marketers said they prioritize that kind of content on social. 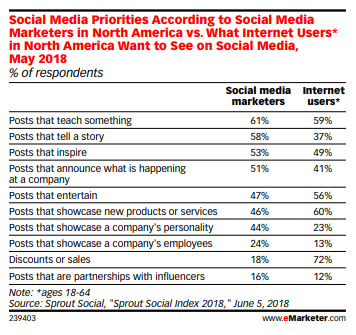 If you aren’t already responding to this, adjust your social plan to prioritize content focusing on discounts or sales, new products or services and posts that teach or entertain. Lowest on your priority list should be influencer content, employee features and company “personality” posts. Programmatic advertising relies on artificial intelligence as an efficient way to distribute content at scale, and it’s even helping to eradicate waste in paid media. Despite concerns about brandy safety and relevant targeting addressed above, marketers are still spending heavily on programmatic, which means you can’t afford not to be doing the same. Moreover, 85% of creative professionals believe artificial intelligence will have a significant impact on their creative output in the next two years. 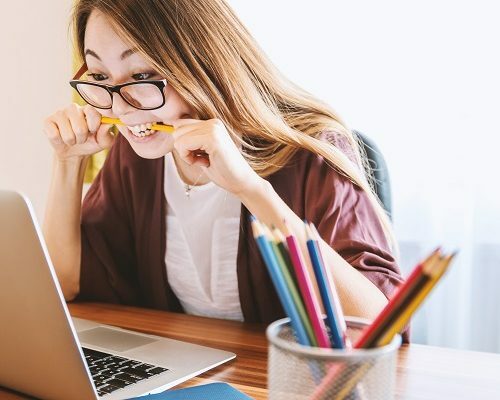 The bottom line is this: AI is slowly seeping into the makeup of marketing and advertising across the board, so if it’s not something you’ve dabbled in yet, you should be prepared to do so soon. The eMarketer report also states that US advertisers are pouring more than nine out of 10 new digital ad dollars into the Facebook-Google duopoly. So while concerns about brand safety on these platforms are still valid and while you also experiment with spending on new channels, you need to stay competitive on the proven and established networks as well. There is no single, correct path on the road to content personalization, but you’ll never find your way if you don’t start putting one foot in front of the other now. It’s a bit daunting and can feel like you’re damned if you do, but also damned if you don’t—just don’t use that imagined crutch as justification to ignore it altogether.